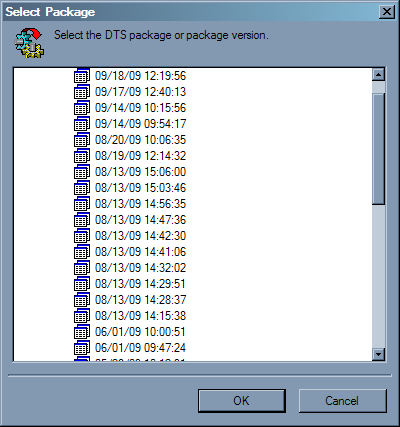 Do you have tons and tons of versions of DTS packages in SQL Server 2008/2005. Every little revision saves a new version on the server. You could end up with hundreds of revisions for just one package. It is a pain to delete each of these one by one. The quickest way to delete these old packages is with a script. Rather than write a script, I went out and searched the web for a solution. I found the script I needed at SQL Server Central. The code will delete all but the newest version of the DTS package. The only thing you need to supply is the DTS package name.